Comments Off on Affordable, Reliable and Timely Microsoft Dynamics GP Customizations at Your Service! Affordable, Reliable and Timely Microsoft Dynamics GP Customizations at Your Service! Most people know their business software from the outside-in. We know Microsoft Dynamics® GP (http://www.sherwood.com/products/microsoft-dynamics-gp/) software from the inside-out, which empowers us to make certain customizations that fit your business solution to your unique business needs. While many experienced code-writers can create scripts to address certain customizations, only the Authorized Microsoft Dexterity developers and Source Code Authorized experts, can create efficient customizations that can stand the test of time, and upgrades. 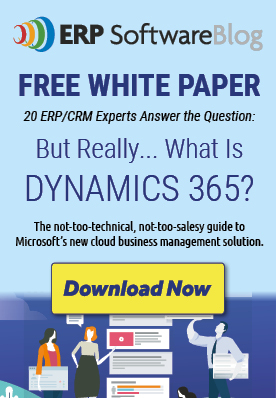 Right out-of-the-box, Microsoft Dynamics GP can provide all that you may be looking for in a business application. It is designed to be all-encompassing and integrated, with the ability to manage the important core business functions – financials, inventory, manufacturing, supply chain, human resources, and more. However, some businesses have unique business operations which create the need for a customization in the solution, such as a query to find data or a specialty report that may be important to your industry or for regulatory compliance. When making changes to your business software, it is important to choose an authorized expert to create a customization that will protect your data, as well as the rest of your software. A skilled code-writer can create a script to find the data you need or create the function that may not be included in the core application. Using .Net developer tools, or creative code-writing, the resulting script could be lengthy and complicated, which will cost you in both time and money. A script could also change how the application runs, which can cause problems within the application and for the users. Instead, an authorized Microsoft Dynamics developer can create your customization quicker, easier, and more efficiently using the source code. Only authorized developers can access the source codes, instead of using the .Net developer tools, to make strategic customizations or enhancements to your Microsoft Dynamics GP solution. Not only will you have a reliable customization, but you will save money and headaches from other more superficial add-ons. The experts at Sherwood Systems know our software inside-out and upside-down. We are able to make the efficient customizations without stepping on the source code, but by finding the right path and enhancing it to give our customers efficient, reliable results. Contact the authorized experts at Sherwood Systems for more information on customizing your Microsoft Dynamics GP solution properly: http://www.sherwood.com/contact/. Posted in About Microsoft Dynamics GP, Choosing a VAR/Partner, Cost of Accounting Software | Comments Off on Affordable, Reliable and Timely Microsoft Dynamics GP Customizations at Your Service!